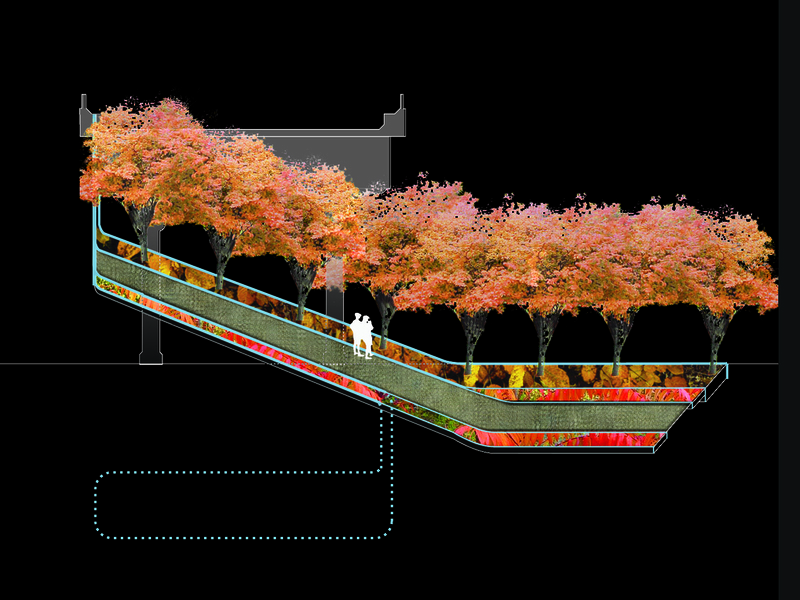 When The High Line is redeveloped, it will bring an exciting range of new spaces into play for New Yorkers. The team recognizes that the qualities of movement through these spaces will define the potentials of The High Line, and that understanding these must be the primary outcome of the design work.The redevelopment of the High Line demanded multidisciplinary teamwork at the highest levels of creativity and design experience. The team established by Zaha Hadid Architects, Balmori Associates, Skidmore, Owings and Merrill LLP and studioMDA linked together these world-class offices with substantial building experience into a networked studio for excellence in urban design. Each of these offices is renowned for well-defined strengths and specializations, and yet together they have discovered a common language and approach in responding to the spatial and temporal challenges underlying the project. The creative adaptation and reuse of old structures typically requires that we suspend our preconceptions of their uses and qualities, and one of the best ways of opening our thinking to new possibilities occurs through the thoughtful process of graphic abstraction for which Zaha Hadid’s office is famous. The team discovered a natural synergy in this approach, for it enabled open discussion of a complex range of issues and details long before deciding on specific uses and placements. Equestrian trails and pedestrian paths are laid across the Greenbelt Park of Staten Island, the proposed site for the 2012 Olympics equestrian venue. These paths connect to existing paths in the park, establishing a wide network that further links it to the various adjacent neighborhoods. A sculptural earth mound provides an elevated pathway from which various events can be seen, and it organizes the layout of the venue grounds. It encloses the arena, creating a shelter from wind and flood, its slopes providing comfortable seating for spectators. In addition, it sets up the relationship between the ‘front of house’, the area that is accessible to spectators, and ‘the back of house’ area that is restricted to equestrian-related activities. Past Olympic grounds have dictated strict separation of the two areas; this proposal, however, rethinks that philosophy. Functional separation is maintained through an elevated mound and a water channel that simultaneously allows perceptual integration with unobstructed views into these restricted areas. After the Olympic Games, facilities such as the grand arena and stables would remain on the site and be incorporated into the Park as permanent elements to support further equestrian activity. Other facilities would be removed or re-programmed to fit the community’s needs.